The one who overcomes – I Am Not Ashamed Of The Gospel Of Christ! To overcome obstacles in our life empowers us to press on through adversity.Even though the flesh is weak we can do all things through Christ who strengthens us!We are to try the spirits to know whether they are of God,and the spirit of God is one that can overcome (1 John 4:1-6). Beloved, believe not every spirit, but try the spirits whether they are of God: because many false prophets are gone out into the world.2 Hereby know ye the Spirit of God: Every spirit that confesseth that Jesus Christ is come in the flesh is of God:3 And every spirit that confesseth not that Jesus Christ is come in the flesh is not of God: and this is that spirit of antichrist, whereof ye have heard that it should come; and even now already is it in the world.4 Ye are of God, little children, and have overcome them: because greater is he that is in you, than he that is in the world.5 They are of the world: therefore speak they of the world, and the world heareth them.6 We are of God: he that knoweth God heareth us; he that is not of God heareth not us. Hereby know we the spirit of truth, and the spirit of error. The word of God protects and sustains us through our life,and to be equipped with Gods knowledge causes us not to dwell in darkness but be as children of light.Therefore when the day of the Lord arrives we will not be overtaken as by a thief (1 Thessalonians 5:1-11). But of the times and the seasons, brethren, ye have no need that I write unto you.2 For yourselves know perfectly that the day of the Lord so cometh as a thief in the night.3 For when they shall say, Peace and safety; then sudden destruction cometh upon them, as travail upon a woman with child; and they shall not escape.4 But ye, brethren, are not in darkness, that that day should overtake you as a thief.5 Ye are all the children of light, and the children of the day: we are not of the night, nor of darkness.6 Therefore let us not sleep, as do others; but let us watch and be sober.7 For they that sleep sleep in the night; and they that be drunken are drunken in the night.8 But let us, who are of the day, be sober, putting on the breastplate of faith and love; and for an helmet, the hope of salvation.9 For God hath not appointed us to wrath, but to obtain salvation by our Lord Jesus Christ,10 Who died for us, that, whether we wake or sleep, we should live together with him.11 Wherefore comfort yourselves together, and edify one another, even as also ye do. 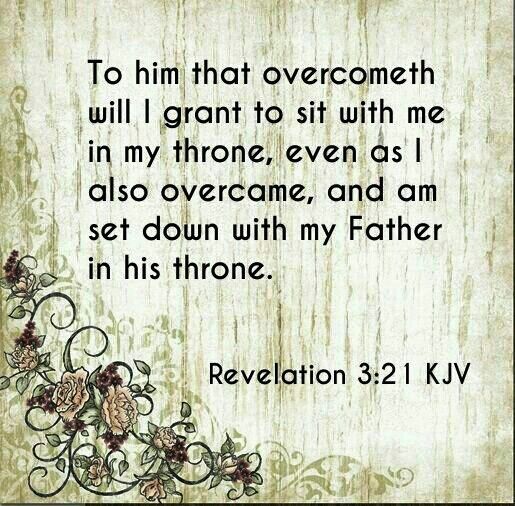 Just as our Lord had to overcome,He will grant us to sit with Him in His throne if we do as well (Revelation 3:12,21). 12 Him that overcometh will I make a pillar in the temple of my God, and he shall go no more out: and I will write upon him the name of my God, and the name of the city of my God, which is new Jerusalem, which cometh down out of heaven from my God: and I will write upon him my new name. 21 To him that overcometh will I grant to sit with me in my throne, even as I also overcame, and am set down with my Father in his throne. Thank you Sister, I needed this today.